It's a time of energy abundance! So crow the pitchmen for the oil and gas industry, eager to spin the current Saudi-overproduction-driven oil glut into something wondrous. A new age for America, part of an exciting time of expansion and growth, driven by ample new supplies of energy! Cheap gas! Big cars! It's 1969 again, baby! Abundance! And on the one hand, taken as a snapshot of this moment in time, that is true. But it is a strange truth, because it masks a larger reality. That reality is that we have arrived at the shores of a new world. It is a world soon to be devoid of fossil fuels. Oh, we have them, now. But within what I can reasonably expect to be my lifetime, our transportation system...and our agriculture...will have to be completely new. This is doable. It is, God willing. It remains within our capacity to adapt, though every year we do not change deepens the challenge. But the global storehouse of fossil-fuel energy is just as finite as it ever was. The only change is that we're pumping it faster, at the same time we're flushing the last drops from the grudging rocks. Within the next fifty years, our entire energy economy will change. It has to, if we're to survive as a species. Being American and all, I remember the history of our American experience, in all its mess and struggle and glory. And that stirred in me a metaphor, as so many things do. What this reminds me of is the experience of those first colonists. 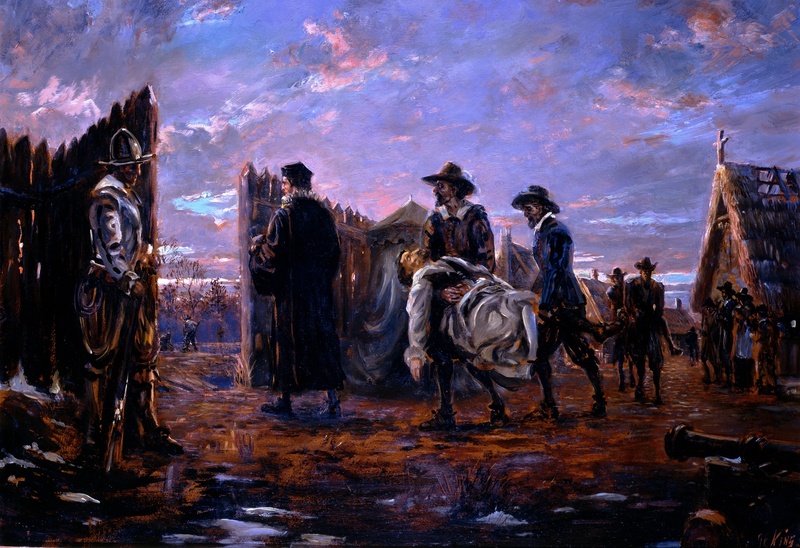 Where we are right now as a country is Jamestown, and it's the Fall of 1609. We are those colonists. We can't grow any more food, because the growing season has passed. What we have in the provisions that we've brought from England and what remains from our sparse harvest will have to get us through the long winter in a new land, until we are able to figure out a way to be self-sufficient. What the sheiks and the pitchmen, the executives and the lobbyists want us to believe is that our finite storehouse is justification for a time of feasting. "Look how much we've got in the storehouse," they smile, as they cut prices and tell us all to eat our fill. "Wow! So much! Time for a celebration! Yay us! Dig in!" Which in Jamestown, in the Fall of 1609, would have been sort of true. But mostly not. That colony barely, barely survived a time of hunger and privation. Others, like the Roanoke colony, simply vanished, dying on the hostile shores of a new world. What we are being told now is wildly unwise, the deluded foolishness of a profit-addled quartermaster. There is no fossil fuel resupply ship. What we have has to last. It has to, for the sake of our future.